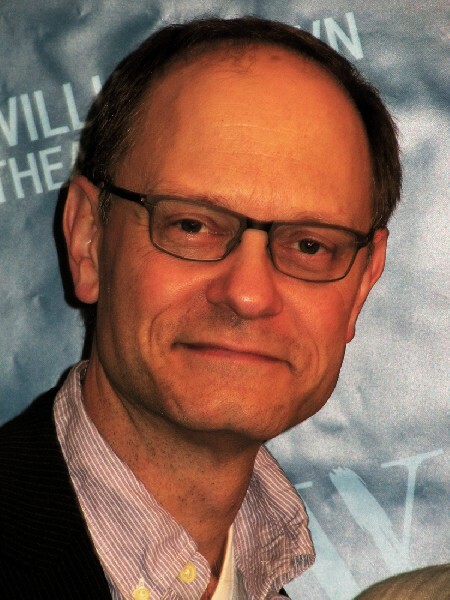 David Hyde Pierce has the financial security to choose projects that challenge him. Giuliano photos. 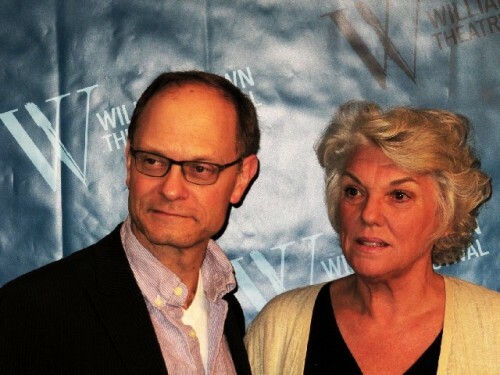 David Hyde Pierce is directing Tyne Daly in The Importance of Being Earnest. Imagine intruding on someone’s life for five minutes. What can you possibly learn about them? Particularly when playing musical chairs with four individuals, two actors and two directors, barraged by a rotation of ravenous members of the press. There is no possibility of clearing the mental palette with the equivalent of a bit of psychic sorbet. The PR notion is that the assembled critics will have the opportunity to grab unique quotes, not the fodder of the general press conference, to flesh out and beef up stories. This is not my usual way of doing things. Often it is only after an hour or an hour and a half that someone really opens up. Imagine, for example, that you had just five minutes with your shrink? Life is full of challenges. It is better to say yes than no. Even five minutes with the fascinating Emmy and Oscar winning, David Hyde Pierce, who is directing Oscar Wilde’s The Importance of Being Earnest for the Williamstown Theatre Festival, is better than nothing..
Actually, if I got the chance to go one on one with John Malkovich I wouldn’t even need all of the allotted minutes to get a great story. I would just launch a zinger and then write volumes about one of his classic, over the top, scorching responses and withering looks. You have to have elephant hide to make it in this business. Like you are the invader of their innermost thoughts and privacy. Unless you make nice and act friendly in which case actors and directors will have you for lunch. Nobody wants to read one of those patty cake stories. There is the Mike Wallace, attack mode, take no prisoners, bonsai approach. Dylan Baker, who plays all those villains, just smiled. Then we settled down and talked for a couple of hours. Brooks Ashmanskas, a WTF regular, likes to go toe to toe and trade head shots. You need band-aids after talking with him. Charles Giuliano I had the great pleasure of seeing you spat upon by Mark Rylance on Broadway in La Bete. That opening scene when food is just gushing out of his mouth in hilarious bursts. Can we talk about that? David Hyde Pierce Yeah. Absolutely. That whole production was an amazing experience. We started it in London where we rehearsed it. Then it ran in the West End before coming to Broadway. So the chance to be there, to live there for three months, was just thrilling. The chance to work with Mark and the chance to work with Matthew Warchus who directed it. I found that play fascinating and a truly dazzling piece of work. CG It is set in an interesting period. DHP It is. It is and I’m always interested in how critics, in its original incarnation and even the second time around, so many of them completely ignored the skill involved in the writing of the play. David (Hirson) wrote it entirely in verse. Not in doggerel but in completely fine iambic pentameter. People seem to take that for granted as though just anyone can do that. But the audiences seemed to like it. CG We have now seen a number of recent plays that talk about art. Like Art by Yasmina Reza. There is a genre in theatre of debating art. CG For me La Bete was about art. The differences between genuine art and a vulgar or populist art. DHP And really showed it to you. Put it right in front of you. CG Although it was a comedy for me it was thought provoking. DHP I’m glad. That’s what we thought it was. Some people agreed with us and some people didn’t. CG So who are you? DHP And what does that mean? CG In view of the various roles you play and their personas when we just kick back who are we talking to? All of the above? None of the above? Addition? Subtraction? DHP If I turned the question around it would be difficult for you to answer. So who am I? If people say “I’m this” there must not be very much to them or they’re fairly un self aware. I don’t know how to answer that. CG Because you were on stage with La Bete you weren’t able to come and support the Indy film in the Williamstown Theatre Festival. That was a weird guy. Where did he come from? The Perfect Host. He was a wacko. DHP Yes. He was. Well. You know. I’ve played all kinds of parts. The thing about being in a long running television show. I even do this. You think that’s basically them. Then they go off and do other parts. Then you realize, no, we’ve seen the most of that one. When I started out I played everything. And I hope to continue to. CG When a script like that comes to you what’s the response? There’s no money involved and a limited audience for The Perfect Host. DHP That’s not an issue for me. I’m very lucky that way. I was lucky to be on a good television show and one that ran a long time. I was able to achieve financial stability that allowed me to make choices based on things that I think are interesting, or fulfilling. That challenge me in some way. It’s not about how am I going to pay my rent. That’s a great blessing. When that script came along it was a perfect balance of a role that started out very much as people used to see me on the television show. Then it took you down this very windy rabbit hole somewhere else. I thought, well, that’s great. Because. That’s a lovely way to wean people off how they usually see me. CG How many scripts do you see? What’s the flow of things that are put in front of you? DHP Umm. Not hundreds and hundreds. I don’t know how many. I tend to. I know when the right one comes along. That’s all I can say. I don’t know what I’m looking for but I know it when I see it. CG Do you work all the time? DHP It’s been a while since I’ve had a significant break.